It's been really hot these days. We're talking about 35 degrees celcius. With the fan blasting at the highest speed, it's still....hot. Not really a comfortable weather to be playing with clay. I've not been touching much lately. Over the weekend, I went to get a new computer screen. Mine had lasted for a solid 10 years or more. Come to think of it, it's really hard to find electrical appliances that last so long anymore, and mine was a bulky monitor! The new range are all flat screen monitors. I opted for a 20 inch screen! Great for playing computer games! On another note, I'm glad I started preparing for the upcoming talk early. It's coming up in slightly over 2 weeks, and I think I'm about 85% ready. I just don't think given the various commitments I have, I could churn anything out in a month's time, so I'm very grateful I had more than 6 month's time to slowly put things together without feeling the rush. I don't have any expectations out of it, as it will really be an interesting experience for me to have so many people viewing my works up close for the first time. I'm just going to see what are the reactions of non-miniature collectors seeing it. 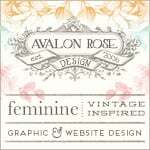 I have some new work made over the last week. 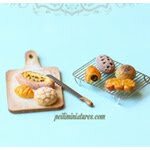 One of which is another 1:12 scale miniature Tarte Profiteroles. It didn't occur to me until my Teammids team mate, Dales mentioned that this would look great on a St. Patrick's day dessert table. :) Pardon me, as I am not really familiar with St. Patrick's Day as we don't celebrate it. But I love the green ribbon; it brings a refreshing feel to it. 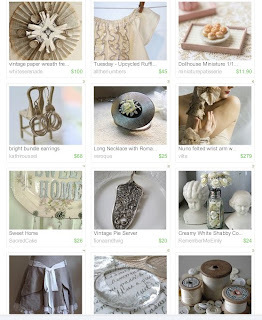 I want to thank IlluminatedPerfume for picking my plate of cream puffs to be in this beautiful Treasury! Love the shades of beige!! 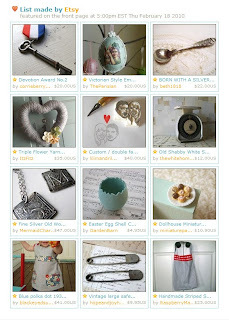 One of the things I enjoy being picked for treasury by other sellers, is finding new interesting shops! Very coincidentally, I love rare unique perfumes, and IlluminatedPerfume handcrafts unique perfumes! Go take a look at some of her yummy scents. Boy, I think I am just going to be very tempted getting some chocolate scents. 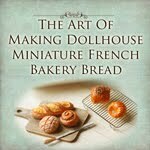 I wrote this for those who are using layman tools for miniature woodwork. If you use power tools/machines, this really won’t be helpful to you. Those who use cutting mat, penknife cutter, ruler, pencil, tacky glue --- this might be helpful ! 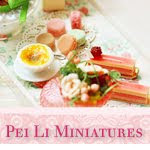 Actually, miniature woodwork is not as scary, but if you develop good habits/practices, you will find that things are so much easier and quicker. 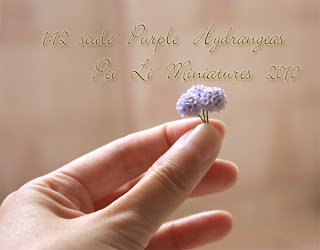 I strongly believe in developing good habits, so here are some personal observations and things I do/don't do when I create miniature woodwork. 2. This might sound like common sense, but to me, it is so crucial. Use the same ruler for your entire piece when you’re cutting. Did you know that different rulers have slight difference in their markings? You won’t realize the impact when you cut, but when you glue your pieces later and wonder why things don’t really match up or fit into the big picture, this is the reason why. 3. This might also sound like common sense, but I will still say it because it’s important. Hold/press onto the ruler tightly when you score against the line. If you don’t hold on tightly and your ruler shifts, your penknife cutter follows and your cutting will be slanted. If that happens, you either carefully cut it back to the measurement indicated, or use a fine sandpaper to sand the sides to the correct measurement. 4. There is a tendency most people score the wood on the same line over and over again, and when the piece becomes a little loose, they manually snap it into 2 with their hands. I understand this is so much easier and faster but if possible, try not to do it, especially for thick pieces. What happens is that you’ll soon realize that it’s not a straight line after you break them, and it can cause an issue when you try to glue 2 pieces together. When the line is slanted, there isn’t enough surface for the wood and glue to bond together. If you insist on gluing the 2 pieces together, you can, but you’d realized that the piece is slanted which cause more issues which in turn you may get frustrated in the process. Always develop good cutting practice, which really helps you to go a long way. 5. Use a fine sandpaper and lightly sand the sides to a straight line if you realize they are not straight but be very careful not to overdo it, because you just might be taking a few millimeters away, which again, can cause an issue later when you glue things together and wonder why things don’t fit. 6. Don’t use a thin, watery glue. Use a good wood glue, preferably thick and tacky. You’ll find that things hold together so much easier and faster. I'll write more good habits when I have more! Meanwhile, happy creating! I woke up this morning and found out I was on the Front Page of Etsy!! 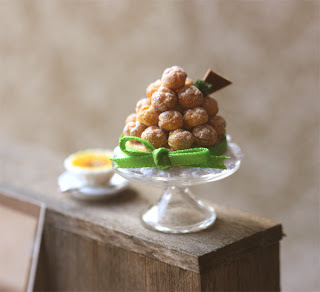 My mixed profiteroles were featured. Here is a completed one I made earlier for Marie... a large tarte profiteroles is what she has requested for. The base itself is almost 2.7cm to 3cm. Definitely the largest I've ever made! I'm so glad she loves it! A New year; a new piece of artwork. 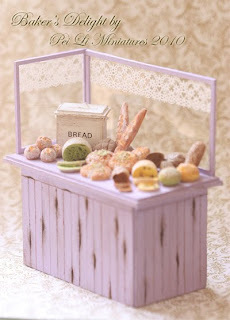 I'm happy to present you my first major work in 2010...a Baker's Delight Display Shelf in 1:12 scale. Something I'm proud to show you as it is my labor of love. 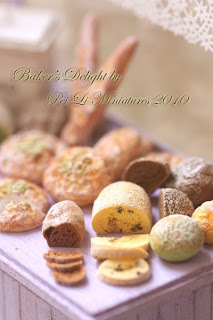 I imagine that a baker would be delighted to see this shelf, so that's why I name it as such. This particular idea has been on my mind for a little while now, since December last year. It did take a while from conception to actual reality. In this journey, I tried a new colour, purple/lilac/lavendar on my new piece. It's so hard NOT to pick my favourite colours. But for some reason, I'm happy I picked this lilac colour, because...I thought this colour was really nice and romantic...Purple is growing on me slowly. The woodwork on this piece is something I am particularly happy about, because though it is hard work, but I find that very enjoyable and relaxing. The natural wear and tear of the display shelf created on the piece is all handpainted. Well, I'm there. Actually I changed course halfway too, because I wanted to inject more personal style into it. I kept the original design too, but that will be for my own collection. Do you like old antique woodwork? There is an old charm to it. It requires more work, but I really like how it turns out. This weekend was terribly busy for me. Chinese New Year is just less than a week away, and I had to do some spring cleaning in my room. Cleaned out the corners, bought a storage box to store some stuff, threw out the old paper box, and also finally sat down to start making new curtains for my room. I bought some very nice pink shabby chic fabric in Spotlight last year, but never had the chance to sit down to sew it for my room. Finally, yesterday evening, I dug out my sewing machine and started working on it. These are very modest curtains, and nothing fancy at all, but a nice looking fabric makes a whole lot of difference! Miniature wise, I have not been able to work a thing this weekend, due to all the cleaning and clearing. 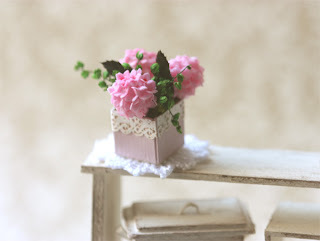 Over the week, I made a little pot of miniature pink hydrangeas which I'm really pleased. I love the colours, love the elegant look. It makes me so happy just looking at it...and I hope it makes you happy too. Mine, on the other hand, is smaller than moth balls, I think. Below is a photo of them in my hand.